The benefit of living in today’s world is having convenient access to modern technology. For one, people now enjoy better health because of it. A variety of portable health monitors help people take better care of their health. And with the new Omron HeartGuide, people will be able to check their blood pressure rate in real time, anytime. The new Omron HeartGuide is a portable blood pressure monitor that users can wear on their wrist. Others may consider it as a digital wrist watch that doubles as a blood pressure monitor. Either way, the Omron HeartGuide is the world’s first wearable blood pressure monitor. It makes use of the oscillometric method of measuring blood pressure. The device does this via an innovative watch band design with a cuff that inflates to measure clinically accurate systolic and diastolic pressure. Aside from its function as a blood pressure monitor, the Omron HeartGuide also functions as a typical fitness watch common today. It can track daily activity such as steps taken, distance travelled, as well as calories one has burned. The smart watch also can monitor a person’s quality of sleep. The Omron HeartGuide also comes with a companion mobile app that will help users understand how monitoring their blood pressure can impact their lifestyle and health. 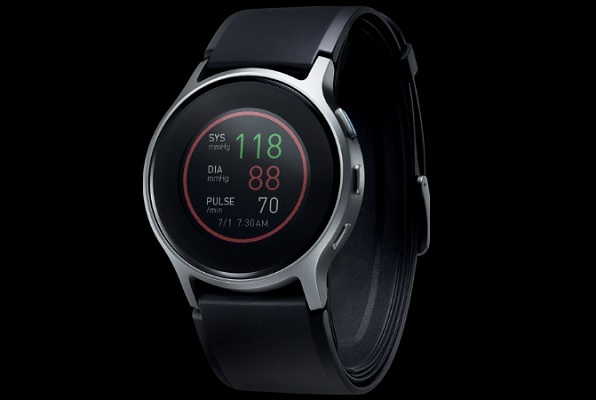 This innovative smart fitness watch is now available at the Omron website for $499. Copyright ©2019 Gadget.com unless otherwise noted.